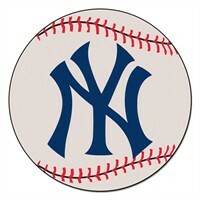 Surprise that New York Yankees fan on your list this holiday season with this New York Yankees baseball shaped rug! This high-quality rug is the perfect addition to your loved one’s bedroom or game room, and can be used as an area rug, or as a display in his or her sports memorabilia collection! Whether you are searching for an accessory that will revamp your son’s bedroom, add character and style to a game room, compliment a sports collection, or present as a gift to that special New York Yankees fan on your list, this New York Yankees baseball shaped area rug is definitely a home run! Each New York Yankees baseball shaped area rug is created when it is ordered, so please remember to allow for additional processing time when ordering your rug. Purchase yours today to ensure that you receive it in time for Christmas!